Love it, and it’s very clever. And it’s really, really easy too. It is, isn’t it. It caught my eye as soon as I saw it. That is an excellent pattern! I would spend hours following the progress of the cubes and looking at the relationships in different ways. There’s a wee touch of Escher in there. Your colour choices for the Mr are excellent. I wonder if he will ever go to work again….. It is an intriguing design, isn’t it? I love flowers and mandalas, but I also love designs inspired by mathematics. In fact I wasn’t sure how well this one would come out, but I’m quite pleased with it so far. As for the colours, I had the chocolate brown already and then I spent about an hour dithering over which two contrasting colours to use (I was working in Red Apple yarn that day) – it was very nearly lime green rather than blue, but Mr Snail likes blue better than green hence the final decision. Now that would be an interesting project to attempt. Ooh, love it! 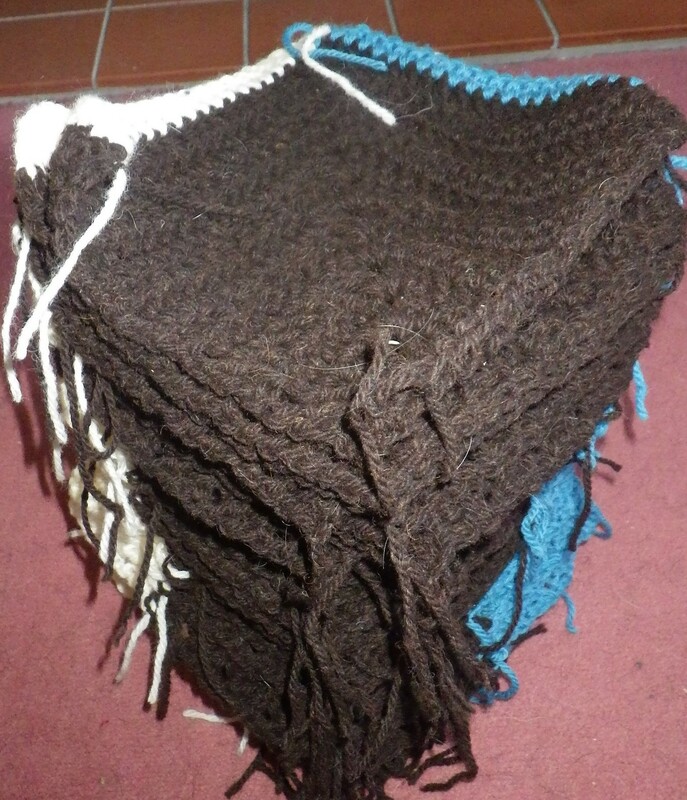 The squares look quite chunky too, so it should be lovely and warm. The initial photo didn’t look so promising, but the job laid out is great (and I’m also glad you went with blue rather than lime!). I dithered for ages, partly because of Mr Snails fondness for chocolate lime sweets! I’ve started attaching then together now and I think it’s going to look rather good. I don’t like the border suggested on the pattern, so I will be making that up myself. I’m wondering about using a grey and some more of the brown, but I’ll have a rummage about to see what I have squirreled away. Actually, how about a lime green border…? This look great – it reminds me of the Building Blocks design in patchwork which always fascinates me. I’d never thought about a version in yarn. I also think the blue was a good choice. Yes, it does have a similarity to that patchwork design… I’d forgotten about that. Well, it looks like the blue was a popular choice. Why does Tialys always get to a blog post first and say exactly what I was going to say?! I thought immediately of the quilt design, too–it’s going to be very effective when it’s all together! That’s going to be an amazing blanket! It is so different, is it a tricky one to make? 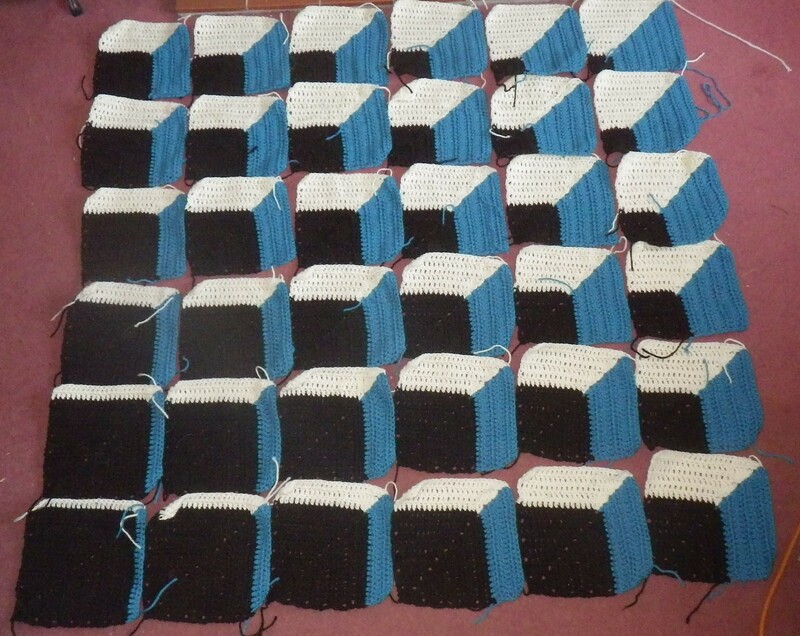 It’s actually really easy – they are just mitred squares with different numbers of rows in each colour. The only thing is keeping a note of how many of each you have made and then attaching them together in the right order. I’m joining in strips and it seems to be going well so far.